It’s hard to say exactly why honeybees the world over are disappearing. Evidence points to viruses, fungi, cell phone use, pesticides, and climate change as potential causes (or parts of a larger cause). But much of the population still remains unaware of the problem and how dangerous it could be to our food system. 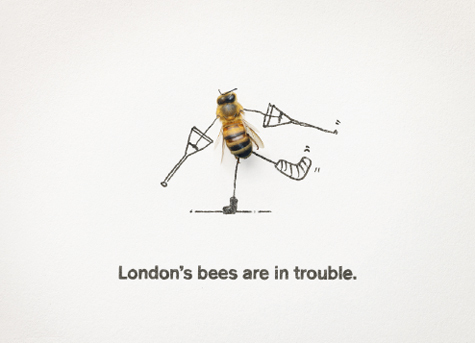 London’s solution: a marketing blitz. honey, and minimizing pesticide use in gardening. The Capital Bee campaign, part of a larger push to create 2012 community food growing spaces in the city by the 2012 Olympics, is also training 50 community beekeepers. The city already has 2,500 registered hives, but lost a third of its bee colonies in the winter of 2009–’10 because of Colony Collapse Disorder. 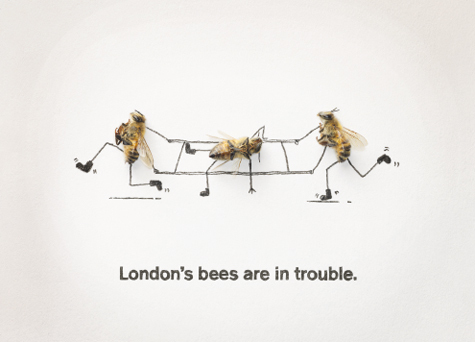 The city has decided to take a darkly humorous approach to the whole thing, retooling work from artist Magnus Muhr–he’s known for his images of dead flies–to show stretcher-bound bees, bees in hospital beds, and bees on medicinal drips on London Underground billboards starting this week. While a series of billboards and YouTube videos may not be enough to galvanize the public into saving the bees (especially since no one knows how to do that), it’s a start–and hopefully, just the beginning of more widespread knowledge about how important the bees are.